The iHealth Infrared No-Touch Forehead Thermometer is just plain awesome. Hold this sleek device close to your forehead (or a child’s forehead) without touching it, tap the button on the back, and you get an impressively accurate temperature reading in less than one second. 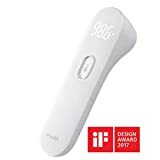 It’s worth twice its regular retail price of $26.99, but a 20% coupon on Amazon gives this iHealth thermometer its first discount ever ahead of Black Friday 2018, dropping the price to just $21.59. High precision: ultra-sensitive infrared sensor measures IR energy emitted from the forehead and collects more than 100 data points per second. Fast testing in just 1 second, get reading instantly. Safe & Hygienic. No-Touch design, non-invasive measurement. Gentle vibration to alert when a reading completed. No annoying beeps. Hold. Aim. Press. Only 3 steps to test, easy for self-measurement. Readable at night with LED backlit. FDA Listed and Medical CE Approved and meets ASTM E19650-98 performance standards.